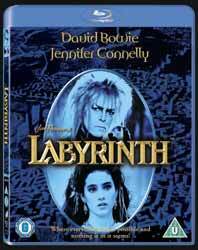 Labyrinth is one of those timeless classics that is capable of appealing to all ages and sexes. Not only was I pleased to be reviewing this, but my other half and teenage son were both really excited that this was being released on Blu-ray. So much so, that I actually took this disc home for a family viewing. I haven't seen this movie for years and was very pleased to see that it's hardly aged a bit. In fact, the only indication that this film wasn't made last week is the rather dated looking CGI owl at the start of the movie. However, as the audio commentary points out, this was created by ILM and is one of the first, if not first, examples of committing a full CGI animal to film. All of the cast (puppets included) turn in great performances and David Bowie's songs still hold up today. These are not songs thrown together for a kid's movie, Bowie has actually done the film proud by recording mature tracks that still stand up today. The story is a mix of various influences, but it's obvious that Alice in Wonderland is the main inspiration behind the plot. Extras include an audio commentary with Brian Froud the conceptual designer (highlights include him pointing out that Toby in the film is actually his son Toby; that the armoured characters in the battle sequence were painted different colours and had different numbers in homage to Thomas the Tank Engine; Kenny Baker remembering Froud for one thing - setting him on fire on set; Froud standing his ground and refusing to allow Jim Henson to put his son on the top of a dangerously high tower for the final act; and the fact that Froud hates the party ending to the movie). Additional extras include The Story Tellers: Picture in Picture (which plays during the film and every now and then a small screen appears in which various crew members talk us through a scene); Inside the Labyrinth Making of Documentary (56 min, 27 sec is the first of several excellent behind the scenes look at the movie. This really opened my eyes to a lot of things about the movie I'd previously been ignorant of. For starters Cheryl McFadden (better known now to Star Trek the Next Generation fans as Gates McFadden who played Doctor Beverley Crusher) was the movie's director of choreography and puppet movement and I wasn't aware that Terry Jones (Monty Python) wrote the script. This featurette also lets us see in more detail some of the Goblins which only appeared on screen for a few seconds); Journey through the Labyrinth: Kingdom of Creatures (27 min, 58 sec is a relatively new featurette which interviews some of the crew members and looks at all of the main characters and uses loads of original behind the scenes footage); Journey Through the Labyrinth: The Quest for the Goblin City (30 min, 04 sec is another modern feature which looks at the design of the movie). Every single one of the extras on this disc is worth sitting through and, unlike other discs, there's replay value here too - I'll certainly be watching the extras again in the near future. I'm presuming that all of these extras (with the possible exception of the picture-in-picture feature) were included on the 2-disc anniversary DVD which was released in 2007 and can now be purchased online for under £4. So whether you buy the Blu-ray or pick up the cheaper DVD is down to personal choice - if you don't have a huge HDTV then the DVD will suffice, for now. Personally though, this is one Blu-ray I'd gladly pay £20 for. It was a fine family movie in 1986 and it's just as fine over 20 years later.